Countess Anna Therese of Arco-Zinnebe married American Colin McKenzie last Saturday, September 30, in Bavaria. I’m not able to legally share photos here but there is a great post over at the Court Jeweller about the bride’s royal connections, tiara and other jewels; Dutch royal blogger Netty Liestra has an excellent recap of the entire event here (including a look at all the royal guests) here as does Luxarazzi, with posts here and here. Finally, there is a good photo gallery of the event here. Also last Saturday, Nicholas Medforth-Mills (formerly Prince Nicholas of Romania) married Alina-Maria Binder in a Romanian Orthodox Service at the Sfântul Ilie Church in Sinaia. Following the ceremony, the couple rode by carriage to the reception site at Sinaia Casino where they waved to crowds from the balcony. Alina-Maria’s dress was designed by a Bucharest-based designer and includes traditional Romanian hand embroidery and the neckline and sleeves. The dress’ high neckline is contrasted with a deeply cut ‘v’ back and the pleated ballgown skirt extends to a short train. The cathedral veil looks like silk tulle and is edged in a leaf patterned lace, which gives some unique texture to the bridal look and frames Alina-Maria’s face in such a pretty way. Her delicate bandeau headpiece looks to be costume- my guess is that as relations are strained between Nicholas and his family (both his mother, Princess Elena, and his aunt, Margarita, Custodian of the Crown, did not attend), Romanian royal jewels were not offered to the couple. This unfortunate situation aside, Alina-Maria’s headpiece brings a beautiful delicacy and lightness to the look that blends beautifully with the veil and suited her petite features very well. Alina-Maria changed into a silk halter dress for dancing (see last photo below) but retained the headpiece. 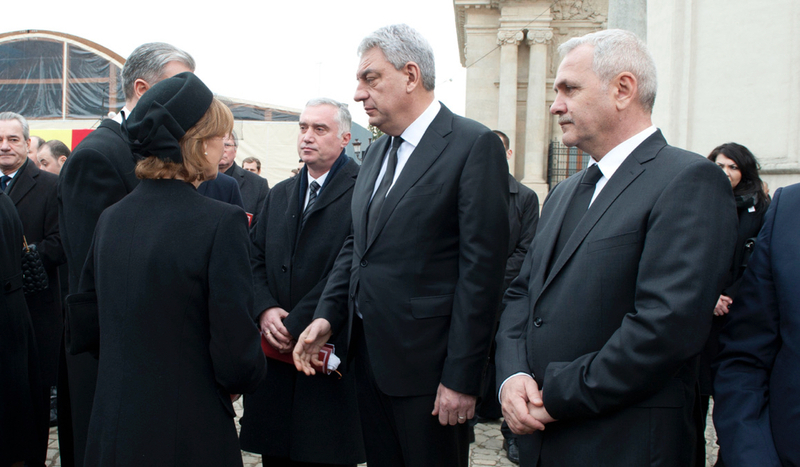 As far as I can tell, no members of the Romanian royal family attended (so no hats to report)- Nicholas’ only sibling Princess Elisabeta-Karina was one of the attendants and did not wear a hat. As part of Romanian National Day celebrations on Wednesday, members of the Romanian royal family hosted an annual Garden Party at the Elisabeta Palace. Crown Princess Margareta wore a pale grey straw hat with square, peaked crown and raised brim around the back. The hat’s crown is embellished in lace appliqué cutouts in the same hues of blue and green as are on her printed dress. It’s an interesting use of a trim we don’t see often on royal hats that worked well with the ensemble once Princess Margarita added her blue coat. Princess Maria updated a hat she wore to this event two years ago, replacing a bright pink hatband, bow and flower with a hatband in the same floral print as her dress. The white straw hat with pink edged kettle brim is further embellished with green silk leaves and a large curling bow. While the new trim feels a bit of a jumble, I’m inclined to give it a pass simply because it’s an attempt at millinery recycling, something we don’t often see. What do you think about this pair of Romanian royal hats? We have come to the last post in our review of the fantastic hats worn at the wedding of the Duke and Duchess of Cambridge four years ago this week. We conclude coverage with a look at the hats worn by royal guests from non-reigning royal families. 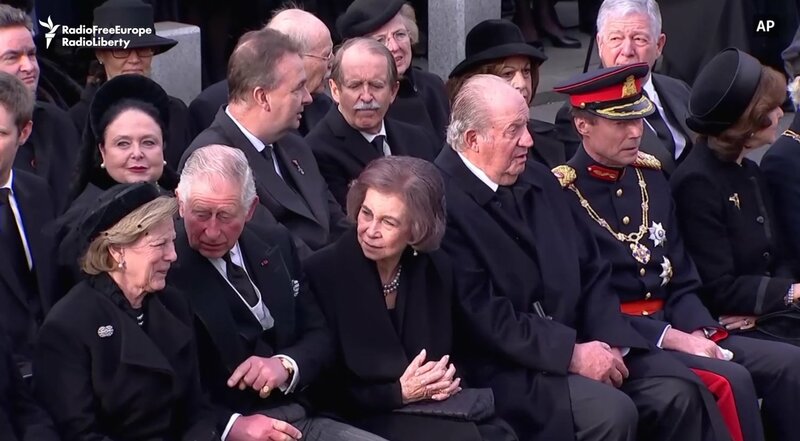 The Greek Royal family have close ties to the British Royals (Prince Philip is a Greek Prince by birth) so it was not surprising to see five members in attendance. Queen Anne-Marie of Greece wore a cream pillbox hat designed by Philip Treacy. The straw was woven with gold threads which gave a shimmering quality to the hat which was trimmed by another signature Treacy bows. Princess Marie-Chantal topped her pale blue and grey embroidered Chanel dress with a statement hat, also by Philip Treacy. The moulded saucer hat was edged in a wide band of silk piping around the brim and was trimmed with large dove grey silk roses that balanced the underside of the vertical brim. This is not a hat for the faint of heart and together with the dress, made for an edgy and extremely haute couture ensemble. While there is every reason for me to dislike the oddly shaped hat, I adore it as part of this ensemble. Queen Margarita of the Bulgarians, pictured behind Princess Victoria in the orange hat below, wore a simple black hat with flat crown and mushroom brim. The hat was trimmed with a wide ruched band around the crown and a large bow at the side. 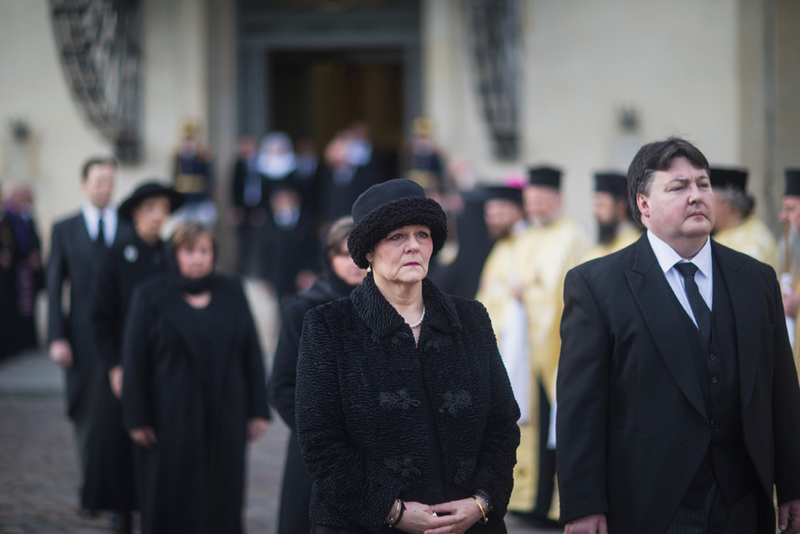 Crown Princess Margareta of Romania wore a most perplexing open-crowned hat by Romanian milliner Kristina Dragomir. Built on a gold ring base, the headpiece consists of swirling loops of pleated crin in three shades of pink. While the photo above shows the headpiece as a soaring swan of sorts, the close-up view here looks like a giant pink slinky on steroids circling her head. Neither look is optimal. Princess Katherine of Serbia wore a simple cream hat made in the same oyster lace as her dress. The fold-back halo brim of the hat was edged in the same ecru satin as her shawled coat and the hat was trimmed with a bow at the back. While it’s not the most modern of royal hats, the shape and scale suited Katherine beautifully and it added the right touch to her ensemble. That draws our week-long royal hat tour at this wedding to a close! If you haven’t already watched the nuptials on video, I suggest you pour a tall glass of your favourite tipple and settle into your comfiest chair. The camera work inside Westminster Abbey is breathtaking and the hats are thrilling. You can watch the entire day’s events here.